Hey everyone. I hope you all are having a great week. I have been enjoying spending time with family and hubby since its spring break here. I have also been induluging in some crafting time. I can't tell you the last time I stayed till 3 am just creating and listening to music. Here are my last few projects. 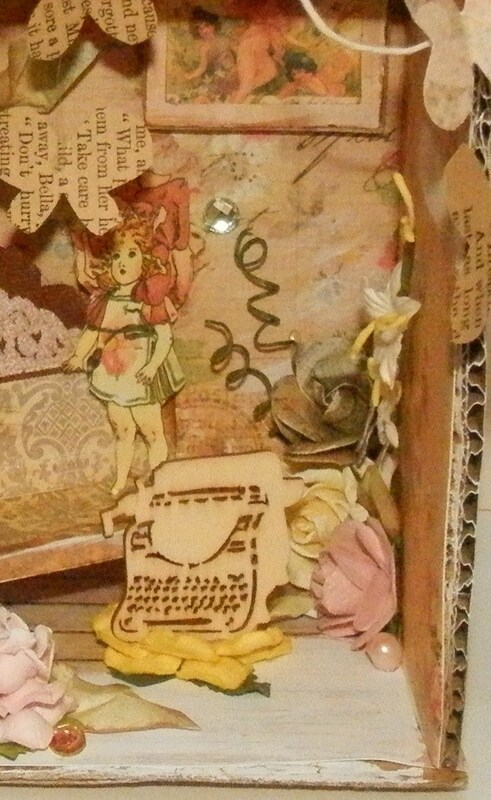 A hand made Circle shadow box. I made it out of card stock. 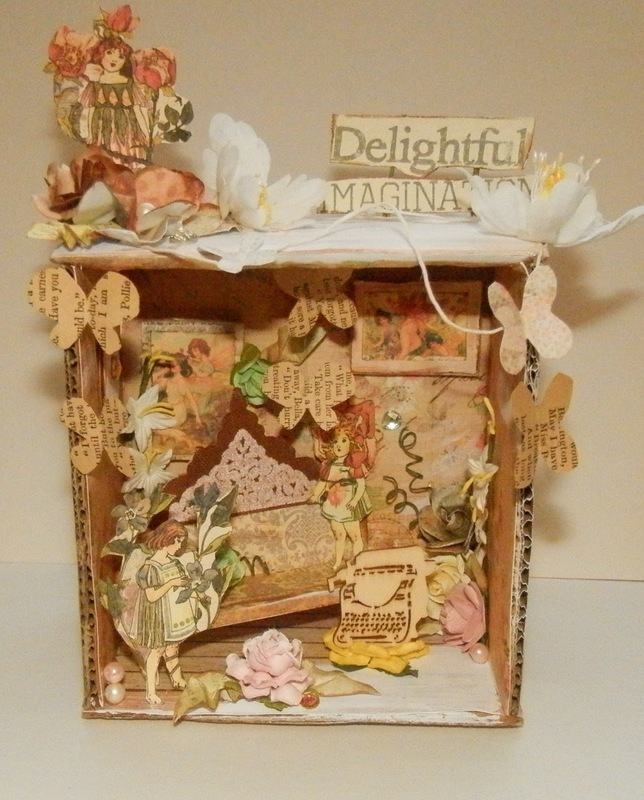 I used Prima's Tea Thyme paper. Lace, chain, Metal trinkets by Prima, wood clock by Prima, and the Special is from the Rondelle chip collection. To cover the top and bottom of the eye glass case I used the Engraver paper by Prima. I also used a little bit of music note paper. I left some of the black case showing. On the inside I painted it with white paint. the inside was velvet so it gave a very nice texture. On the outside I used another Metal Trinket by Prima. lace, pearls, bling, and some scraps form the Lyric collection. I made the room out of card board. 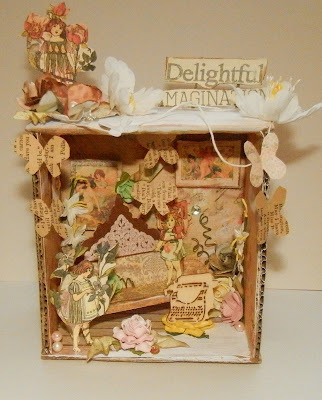 I covered the all sides with the Fairy Rhymes Collection by Prima. I made a little couch, and picture frames for the wall. All made out of paper. 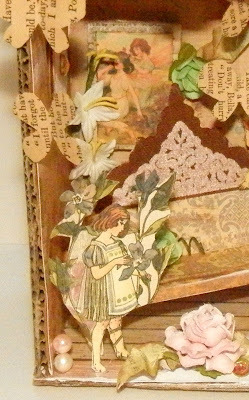 I cut the little fairies out of the Fairy Rhymes paper and glued them around. they were growing out of the floor boards. 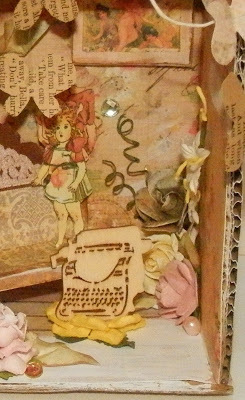 I butterflies out of book text paper and glue them on Invisible thread. I wanted them to appear to be flying with out really seeing lots of strings.